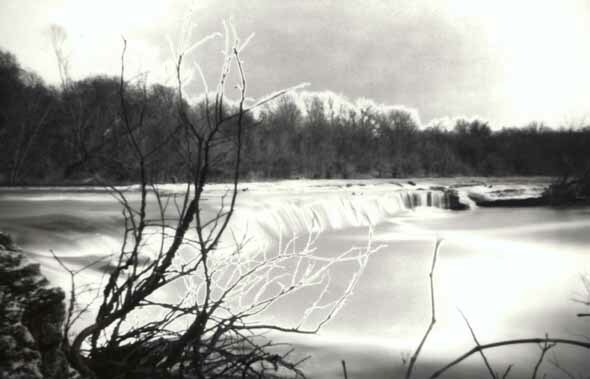 Pinhole photograph by Ed Buffaloe, solarized on Agfa Brovira grade 3. A. Ilford Ilfobrom Galerie Grade 4 paper. C. Dilute the developer 1:1 and make sure its temperature is 70 degrees F., or less. D. Use a 40 or 60 Watt light bulb placed about 4 feet above the developing tray. A. Place negative in enlarger and focus. B. Choose an appropriate aperture. C. Make a series of test strips at three second or quarter-stop intervals. D. Place test in developer and agitate for 50 to 80 seconds. E. Lift print out of developer and float it on the surface. F. Turn on solarization light for 1 to 5 seconds. G. Continue development with agitation for another 60 to 90 seconds. H. Stop and fix as usual. I. Evaluate test print and determine desired exposure. A. Note exposure/development information on back of paper. B. Place paper in easel and expose for the desired length of time. C. Place paper in developer and agitate for 50 to 80 seconds. D. Lift print out of developer and float it on the surface. E. Turn on the solarization light for 1 to 5 seconds. F. Continue development with agitation for another 60 to 90 seconds.